Managing emails, to-do lists and calendar appointments is an office skill which more and more people are finding they need to develop as an increasing amount of our working lives is spent fielding queries and chasing up tasks from behind our computers. 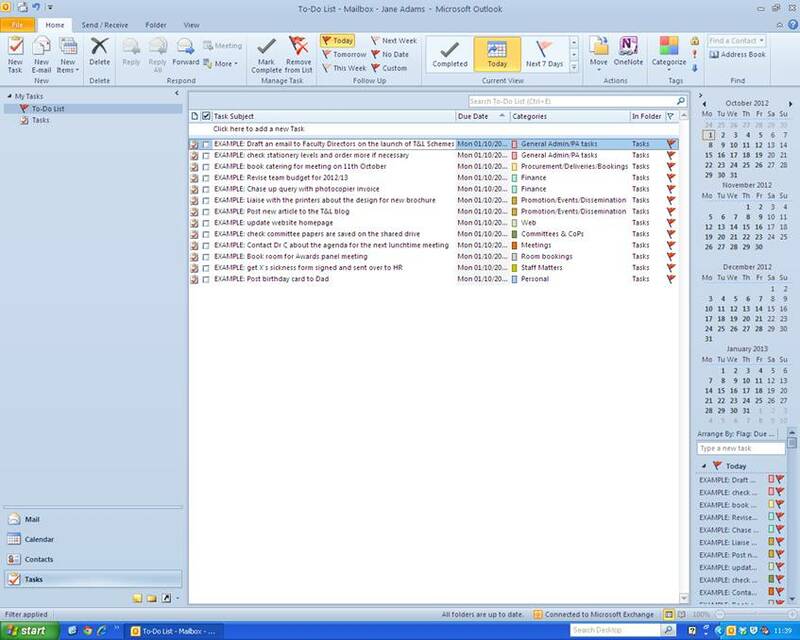 Colour coding these Outlook tools is not a new concept for many administrators or PAs however it is starting to become more and more relevant for those not in support roles who simply find themselves communicating with colleagues via email and generating a large amount of correspondence which often needs to be referred to at a later date. As such I have been asked recently to help teach non-administrative colleagues about how I make Outlook work for me, and in turn how it helps me to be a more effective administrator. I hope this blog will help anyone not already using this method of Outlook management. This entry was posted in Training & resources and tagged Administrator, Colour coding, Diary management, Email, Jane Adams, Microsoft Outlook, Personal Assistant (PA), To-do lists. Bookmark the permalink.